Rockabilly-Online » Blog Archive » The Soul of Texas! 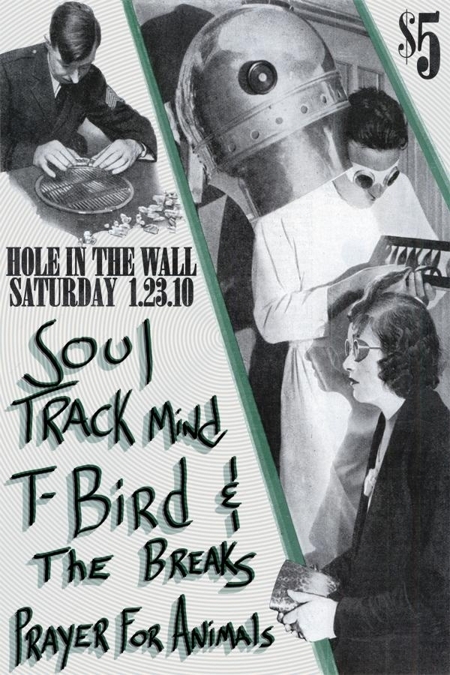 “Soul Track Mind” is a jumpin’, jivin’ soul music collective from Austin Texas! Always hep and heavy, they can get the leanest, meanest square dancing away. Today we sat down with front man Donovan Keith to get the full story. Tell us the history of the band? I moved to Austin in January of 2008 from the Midwest, specifically to put a Soul band together. Having only a Theater and Karaoke background, I had no clue how I was to actually do that. But I just had an idea in my head about how I wanted it to sound and feel. I met most of the band on Craigslist believe it or not, and we had our first gig 6 months later. In October of 2008 we were able to pickup a regular Wednesday night gig at TC’s Lounge. We’ve been playing there for a year and 10 months, but that will come to an end with our last show on July 28th this year. We built our base at TC’s and received incredible local attention and press for a band without an album. Most of that base was built upon word of mouth so it’s taken some time, but that weekly TC’s gig was the foundation for all of our current success. I was raised on older music, listening to nothing but the St. Louis Oldies station KLOU 103 when I was 5 years old and digging the likes of Jackie Wilson, Sam Cooke, Little Richard, Otis Redding etc. So that’s where I get my vocal inspiration from. Each individual of the band has their own story that makes their musical influence and what they bring to the band unique. For instance the guitar player Jonathon grew up on older music as well, but more classic rock than soul. Sam the keys player was more blues and rock like a Joe Cocker/Leon Russel kinda thing. The Drummer is more hip hop, bass player is more funk, the Sax player is more Jazz. That mix where everybody brings something different is what gives us our fresh sound. Who currently makes up the lineup? American music seems to be at war with itself at the moment. There’s wellspring of electronic dance/pop music on the radio, but the less mainstream stuff is all going back to roots music. Country, rock, surf, folk, soul, etc. What do you make of that? I think that electro modern pop you hear on the radio is void of any heart or passion. Even the kind of rap and hip hop with all electronic beats and no musicians, I feel the exact same way. The heart and passion of music comes from the unity of people. Once you remove the band and their instruments and replace them with sounds from a machine, you lose that organic feel. The power of the music diminishes. Roots music is very spiritual and universally binding by nature. Blues, Soul, Country, Folk, etc. They’re all organic forms of music that were born from the heart. Personally it means more to me that my audiences are moved or inspired by our performance. I’ve always said I would rather touch ten souls than make a thousand people dance. I imagine a lot of musicians feel the same way. What non-soul music do you guys listen too? As a band we’re all over the place like I mentioned before with our influences. If it’s not soul, I like Classic Rock, Blues, Reggae, Ska, Swing Jazz. Other guys listen to Rap and Hip Hop. Our Trombone player Jon listens to a lot of Indie Rock. It varies. You guys are always dressed so sharp. Any tips for the wallflowers out there? Well we dress nice in order to stay with the traditions and history of the music and those who played it. It shows disrespect to do it any other way. At the same time, we don’t wear vintage clothes because we were clearly not born in that generation. We don’t pretend to be from 50 years ago. So any tip we could give is just to be honest with yourself and how you look. Be genuine. And take a woman along. Her eyes see colors far better than any man. You have an album on the way correct? Yes. ‘Ghost Of Soul’. It will officially be released on August 17th, with our Album Release Party on August 20th at The Independent near East 5th. It’s gonna be Earth shattering. Austin, Texas is known for it’s blues music, but you’re bringing in some of that motown vibe. Do the locals dig it? We also opened for Del Castillo at Antones not too long ago in front of many of their fans and they really seemed to dig it also. What else is down the pipeline? We’ve already started writing songs for the second album, but that will take a while. We’ve set goals for where we’d like to be. Everyone in the band is from some other part of the U.S. so eventually we want to take visits to all of our hometowns and play there. A big goal of ours is to play ACL 2011. We’ll see how that goes.